Bruno Blanchet (Nov. 2001 — Nov. 2003), David Monniaux (Nov. 2001 — Aug. 2007), Laurent Mauborgne (Nov. 2001 — Aug. 2010). Astrée stands for Analyseur statique de logiciels temps-réel embarqués (real-time embedded software static analyzer). 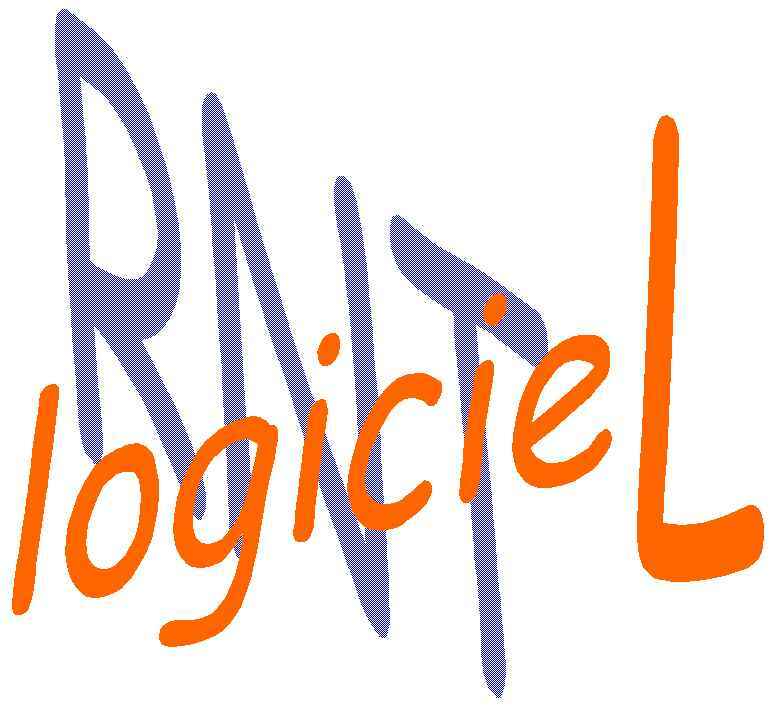 The development of Astrée started from scratch in Nov. 2001 at the Laboratoire d'Informatique of the École Normale Supérieure (LIENS), initially supported by the ASTRÉE project, the Centre National de la Recherche Scientifique, the École Normale Supérieure and, since September 2007, by INRIA (Paris—Rocquencourt). Astrée is a static program analyzer aiming at proving the absence of Run Time Errors (RTE) in programs written in the C programming language. On personal computers, such errors, commonly found in programs, usually result in unpleasant error messages and the termination of the application, and sometimes in a system crash. In embedded applications, such errors may have graver consequences. Astrée analyzes structured C programs, with complex memory usages, but without dynamic memory allocation and recursion. This encompasses many embedded programs as found in earth transportation, nuclear energy, medical instrumentation, aeronautic, and aerospace applications, in particular synchronous control/command such as electric flight control ,  or space vessels maneuvers . In Nov. 2003, Astrée was able to prove completely automatically the absence of any RTE in the primary flight control software of the Airbus A340 fly-by-wire system, a program of 132,000 lines of C analyzed in 1h20 on a 2.8 GHz 32-bit PC using 300 Mb of memory (and 50mn on a 64-bit AMD Athlon™ 64 using 580 Mb of memory). 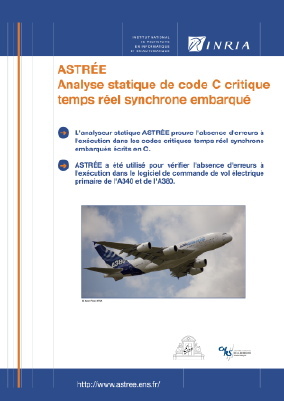 From Jan. 2004 on, Astrée was extended to analyze the electric flight control codes then in development and test for the A380 series. The operational application by Airbus France at the end of 2004 was just in time before the A380 maiden flight on Wednesday, 27 April, 2005. In April 2008, Astrée was able to prove completely automatically the absence of any RTE in a C version of the automatic docking software of the Jules Vernes Automated Transfer Vehicle (ATV) enabling ESA to transport payloads to the International Space Station . Starting Dec. 2009, Astrée is available from AbsInt Angewandte Informatik (www.absint.de/astree/). The design of Astrée is based on abstract interpretation, a formal theory of discrete approximation applied to the semantics of the C programming language. The informal presentation Abstract Interpretation in a Nutshell aims at providing a short intuitive introduction to the theory. A video introduces program verification by abstract interpretation (in French: « La vérification des programmes par interprétation abstraite » ). More advanced introductory references are ,  and . occasionally signal errors that cannot really happen (false alarms on spurious executions e.g. when hypotheses on the execution environment are not taken into account). Of course, the goal is to be precise, that is to minimize the number of false alarms. The analysis must also be cost-effective, e.g. being a small fraction of the costs of running all tests of the program. In the context of safety-critical reactive software, the goal of zero false alarm was first attained when proving the absence of any RTE in the primary flight control software of the Airbus A340. Astrée is based on the theory of abstract interpretation [1,2,3] and so proceeds by effectively computing an overapproximation of the trace semantic properties of analyzed programs and then proving that these abstract properties imply the absence of runtime errors. The program analysis is iterative , structural  (by induction on the program syntax), interprocedural and context-sensitive for procedures , and extremely precise for memory . It combines several abstractions of a trace semantics [7,19] with a weak form of reduced product [7,26]. The basic general-purpose abstractions are either non-relationals (like intervals [4,5])) or weakly relational (like octagons ) with uniform interfaces . Astrée precision comes from a clever handling of disjuctions [12,14,19] and domain-specific abstract domains [13,17] for control/command. Most abstractions are infinitary which requires convergence acceleration with widening/narrowing [5,9]. The soundness of the abstractions is based on Galois connections [5,7] or concretization-based  in absence of best abstraction. Which Program Run-Time Properties are Proved by Astrée? Any violation of optional, user-provided assertions (similar to assert diagnostics for example), to prove user-defined run-time properties. Astrée is parameterized so as to be adaptable to the end-user verification needs. The examples below show typical difficulties in statically analyzing control/command programs. Of course, the real difficulty is to scale up! Control/command programs, in particular synchronous ones, manipulate thousands of boolean variables. Analyzing which program run-time properties hold when each such boolean variable is either true or false rapidly leads to a combinatorial explosion of the number of cases to be considered, that is prohibitive time and memory analysis costs. yields no warning (thanks to the relationskip automatically determined between B and X), thus proving the absence of any run-time error (integer divide-by-zero can never happen when executing this program). Astrée has shown to be able to handle successfully thousands of boolean variables, with just enough precision to avoid both false alarms and combinatorial explosion . which could have been thought to print respectively 2.0e21 and 2.0 (based on the reasoning that (x+a)-(x-a) = 2a, which is erroneous because of roundings)! Astrée is sound for floating point computations in that it takes all possible rounding errors into account (and there might be cumulative effects in programs computing for hours) [12,13]. The absence of overflow (and more precisely that P is in [-1327.05, 1327.05] as found by Astrée) is not obvious, in particular because of 32/64 bits floating point computations. The situation is even more inextricable in the presence of boolean control, cascades of filters, etc. Astrée knows enough about control theory to make precise analyzes of filters [12,13]. Some static analyzers consider only some of the possible run-time errors while others sort out the most probable ones. The aim is then static testing (that is to find out the most frequent bugs) rather than verification (that is to prove the absence of any run-time error). In contrast Astrée is sound. Astrée will always exhaustively consider all possible run-time errors and never omit to signal a potential run-time error, a minimal requirement for safety critical software. Some static analyzers (e.g. using theorem provers) require programs to be decorated with inductive invariants. In contrast Astrée is fully automatic, that is never needs to rely on the user's help. Some static analyzers have high computational costs (typically hours of computation per 10,000 lines of code) while others may never terminate or terminate out of memory. In contrast Astrée has shown to be efficient and to scale up to real size programs as found in the industrial practice. Since 2005, Astrée can run on multicore parallel or distributed machines . General-purpose static analyzers aim at analyzing any program written in a given programming language and so can only rely on programming language-related properties to point at potential run-time errors. Specialized static analyzers put additional restriction on considered program and so can take specific program structures into account. In contrast, Astrée is domain-aware and so knows facts about application domains that are indispensable to make sophisticated proofs. For example, Astrée takes the logic and functional properties of control/command theory into account as implemented in control/command programs  . Moreover, Astrée is parametric. This means that the rate (cost of the analysis / precision of the analysis) can be fully adapted to the needs of Astrée's end-users thanks to parameters and directives tuning the abstraction. Astrée is modular. It is made of pieces (so called abstract domains) that can be assembled and parameterized to build application specific analyzers , fully adapted to a domain of application or to end-user needs. Written in OCaml, the modularization of Astrée is made easy thanks to OCaml's modules and functors. Finally, Astrée is extensible. In case of false alarms, it can be easily extended by introducing new abstract domains enhancing the precision of the analysis. A consequence of generality may be low precision. Typical rates of false alarms (i.e. spurious warnings on potential errors than can never occur at runtime) are from 10% to 20% of the C basic operations in the program. Specialized static analyzers achieve better precision (e.g. less than 10% of false alarms). Even a high selectivity rate of 1 false alarm over 100 operations with potential run-time errors leaves a number of doubtful cases which may be unacceptable for very large safety-critical or mission-critical software (for example, a selectivity rate of 1% yields 1000 false alarms on a program with 100 000 operations). In contrast Astrée, being modular, parametric and domain-aware can be made very precise and has shown to be able to produce no false alarm, that is fully automated correctness proofs. Theoretical work was done on locating the origin of alarms  . Rapid overviews of Astrée is proposed in  and . Presentation of the Astrée static analyzer on Tuesday August 24th, 2004 at the topical day on abstract interpretation of the IFIP World Computer Congress in Toulouse (France). Presentation of Astrée on January 20th, 2005 at the Industrial day on Automatic Tools for Program Verification, a satellite event of VMCAI'05, Paris, January 17—19, 2005. Presentation of Astrée on March 21st, 2007 at the thirteenth ASTReNet Workshop on Formal Aspects of Source Code Analysis and Manipulation , BCS-FACS, London, England. Presentation of Astrée on December 8th, 2007 at the 11th Annual Asian Computing Science Conference, ASIAN'06 , National Center of Sciences, Tokyo, Japan. Presentation of Astrée on June 5th, 2007 at the First IEEE & IFIP International Symposium on Theoretical Aspects of Software Engineering, TASE 2007 , Tutorial, Shanghai, China. Presentation of Astrée on October 11th, 2007 at the Embedded Systems Week , Sept 30th—Oct. 5th, Salzburg, Austria. Présentation et démonstration d'Astrée on October 11th, 2007 at the XIVes Rencontres INRIA - Industrie , INRIA Rocquencourt, France. Presentation of Astrée on 16—17 October 2007 at the ES_PASS Workshop , Berlin, Germany. Presentation of Astrée on December 10th 2007 at the School of Computer and Communication Sciences Seminar , École Polytechnique Fédérale de Lausanne (EPFL), Switzerland. Presentation of Astrée on December 12th, 2007 at the 2007 ISoLA Workshop On Leveraging Applications of Formal Methods, Verification and Validation, Special Workshop Theme: Formal Methods in Avionics, Space and Transport , Poitiers, France. Présentation d'Astrée on December 20th, at the Séminaire du LINA, Laboratoire d'informatique de Nantes Atlantique , Nantes, France. Presentation of Astrée on January 18th at the Seminar , Computer Science Department, Stony Brook University, Stony Brook, New York, USA. Presentation of Astrée on February 5th, 2008 at the Seminar , Center for Computational and Systems Biology (COSBI), The Microsoft Research — University of Trento, Trento, Italy. Presentation of Astrée on February 19th, 2008 at the Colloquia Patavina , Dipartimento di Matematica Pura ed Applicata, Università degli Studi di Padova, Padova, Italy. Presentation of Astrée on April 15th, 2008 at the Dagstuhl seminar 08161, « Scalable Program Analysis » , Schloss Dagstuhl, Germany. Presentation of Astrée on August 26th, 2008 at the Max Planck Institute for Software Systems , Saarbrücken, Germany. Presentation of Astrée on September 19th, 2008 at the Final review of the ESA ITI project Space Software Validation using Abstract Interpretation (SSVAI) . Noordwijk, The Netherlands. Presentation of Astrée on October 30th, 2008 at the Seoul National University, Computer Science & Engineering, Distinguished Lecture Series , Seoul, Korea. Presentation of Astrée on November 21th, the Computer Science Colloquium , Computer Science, New York University, New York, NY, USA. Presentation of Astrée on December 4th, 2008 at the Airbus workshop on formal verification tools strategy , Toulouse, France. Presentation of Astrée on January 18th, 2009 at the Tenth International Conference on Verification, Model Checking, and Abstract Interpretation VMCAI'2009 , Savannah, GA, USA. Presentation of Astrée on May 27th, 2009 at the Doctorate Program PUMA, Program and Model Analysis (Graduiertenkolleg Programm- Und Modell-Analyse) , Fakultät für Informatik, Technische Universität München and the Fakultät für Informatik, Ludwig-Maximilians-Universität München, Germany. Technique et Science Informatique, Vol. 19, Nb 1-2-3. Janvier 2000, Hermès, Paris, France. pp. 155—164. In Informatics, 10 Years Back - 10 Years Ahead , R. Wilhelm (Ed. ), Lecture Notes in Computer Science 2000, pp. 138—156, 2001. In Building the Information Society , R. Jacquard (Ed. ), Kluwer Academic Publishers, pp. 359—366, 2004. Static Determination of Dynamic Properties of Programs. In Proceedings of the second international symposium on Programming , B. Robinet (Ed), Paris, France, pages 106—130, 13—15 April 1976, Dunod, Paris. In Conference Record of the Sixth Annual ACM SIGPLAN-SIGACT Symposium on Principles of Programming Languages , pages 238—252, Los Angeles, California, 1977. ACM Press, New York. In IFIP Conference on Formal Description of Programming Concepts , E.J. Neuhold, (Ed. ), pages 237—277, St-Andrews, N.B., Canada, 1977. North-Holland Publishing Company (1978). In Conference Record of the Sixth Annual ACM SIGPLAN-SIGACT Symposium on Principles of Programming Languages , pages 269—282, San Antonio, Texas, 1979. ACM Press, New York. Programming Language Implementation and Logic Programming, Proceedings of the Fourth International Symposium, PLILP'92, Leuven, Belgium, 13—17 August 1992, Volume 631 of Lecture Notes in Computer Science, pages 269—295. © Springer-Verlag, Berlin, Germany, 1992. The Calculational Design of a Generic Abstract Interpreter. In Broy, M., and Steinbrüggen, R. (eds. ): Calculational System Design. NATO ASI Series F. Amsterdam: IOS Press, 1999. Bruno Blanchet, Patrick Cousot, Radhia Cousot, Jérôme Feret, Laurent Mauborgne, Antoine Miné, David Monniaux & Xavier Rival. Design and Implementation of a Special-Purpose Static Program Analyzer for Safety-Critical Real-Time Embedded Software, invited chapter. In The Essence of Computation: Complexity, Analysis, Transformation. Essays Dedicated to Neil D. Jones , T. Mogensen and D.A. Schmidt and I.H. Sudborough (Editors). Volume 2566 of Lecture Notes in Computer Science, pp. 85—108, © Springer. Bruno Blanchet, Patrick Cousot, Radhia Cousot, Jérôme Feret, Laurent Mauborgne, Antoine Miné, David Monniaux, & Xavier Rival. In PLDI 2003 — ACM SIGPLAN SIGSOFT Conference on Programming Language Design and Implementation , 2003 Federated Computing Research Conference, June 7—14, 2003, San Diego, California, USA, pp. 196—207, © ACM. Static analysis of digital filters. In ESOP 2004 — European Symposium on Programming , D. Schmidt (editor), Mar. 27 —Apr. 4, 2004, Barcelona, ES, Volume 2986 of Lecture Notes in Computer Science, pp. 33—48, © Springer. Astrée: verification of absence of run-time error. In Building the Information Society , R. Jacquard (Ed. ), Kluwer Academic Publishers, pp. 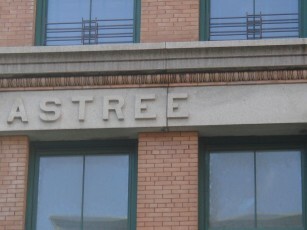 385—392, 2004. Relational abstract domains for the detection of floating-point run-time errors. In ESOP 2004 — European Symposium on Programming , D. Schmidt (editor), Mar. 27 — Apr. 4, 2004, Barcelona, Volume 2986 of Lecture Notes in Computer Science, pp. 3—17, © Springer. Weakly relational numerical abstract domains. Thèse de l'École polytechnique, 6 December 2004. The arithmetic-geometric progression abstract domain. In VMCAI 2005 — Verification, Model Checking and Abstract Interpretation , R. Cousot (editor), Volume 3385 of Lecture Notes in Computer Science, pp. 42—58, 17—19 January 2005, Paris, © Springer. Patrick Cousot, Radhia Cousot, Jérôme Feret, Laurent Mauborgne, Antoine Miné, David Monniaux & Xavier Rival. In ESOP 2005 — The European Symposium on Programming , M. Sagiv (editor), Volume 3444 of Lecture Notes in Computer Science, pp. 21—30, 2—10 April 2005, Edinburgh, © Springer. Laurent Mauborgne & Xavier Rival. Trace Partitioning in Abstract Interpretation Based Static Analyzer. In ESOP 2005 — ; The European Symposium on Programming , M. Sagiv (editor), Volume 3444 of Lecture Notes in Computer Science, pp. 5—20, 2—10 April 2005, Edinburgh, © Springer. Understanding the Origin of Alarms in Astrée. In SAS'05 — The 12th International Static Analysis Symposium , Chris Hankin & Igor Siveroni (editors), Volume 3672 of Lecture Notes in Computer Science, pp. 303—319, 7—9 September 2005, London, UK, © Springer. The Parallel Implementation of the Astree Static Analyzer. In APLAS 2005 — The Third Asian Symposium on Programming Languages and Systems , Kwangkeun Yi (editor), Volume 3780 of Lecture Notes in Computer Science, pp. 86—96, 2—5 November 2005, Tsukuba, Japan, © Springer. Abstract Dependences for Alarm Diagnosis. In APLAS 2005 — The Third Asian Symposium on Programming Languages and Systems , Kwangkeun Yi (editor), Volume 3780 of Lecture Notes in Computer Science, pp. 347—363, 2—5 November 2005, Tsukuba, Japan, © Springer. Symbolic Methods to Enhance the Precision of Numerical Abstract Domains. In VMCAI 2006 — Seventh International Conference on Verification, Model Checking and Abstract Interpretation , E. Allen Emerson & Kedar S. Namjoshi (editors), Volume 3855 of Lecture Notes in Computer Science, pp. 348—363, 8—10 January 2006, Charleston, South Carolina, USA, © Springer. Field-Sensitive Value Analysis of Embedded C Programs with Union Types and Pointer Arithmetics. In Proceedings of the 2006 ACM SIGPLAN/SIGBED Conference for Languages, Compilers, and Tools for Embedded Systems (LCTES 2006) , 14—16 June 2006, Ottawa, Ontario, Canada. ACM Press, pp. 54—63. L'analyseur statique Astrée , Grand Colloque TIC 2006, Session RNTL « Systèmes embarqués », Centre de congrès, Lyon, 15 novembre 2006. Patrick Cousot, Radhia Cousot, Jérôme Feret, Laurent Mauborgne, Antoine Miné, David Monniaux, & Xavier Rival. Combination of Abstractions in the Astrée Static Analyzer. In 11th Annual Asian Computing Science Conference (ASIAN'06), National Center of Sciences, Tokyo, Japan, December 6—8, 2006. LNCS 4435, Springer, Berlin, pp. 272—300, 2008. Patrick Cousot, Radhia Cousot, Jérôme Feret, Laurent Mauborgne, Antoine Miné, David Monniaux, and Xavier Rival. Varieties of Static Analyzers: A Comparison with Astrée, invited paper. First IEEE & IFIP International Symposium on ``Theoretical Aspects of Software Engineering'', TASE'07 , Shanghai, China, 6—8 June 2007, pp. 3—17. In EMSOFT 2007, Embedded Systems Week, Salzburg, Austria, September 30th, 2007, pp. 7—9, ACM Press. Patrick Cousot, Radhia Cousot, Jérôme Feret, Laurent Mauborgne, Antoine Miné, and Xavier Rival. Why does Astrée scale up. Formal Methods in System Design , Springer, to appear, 2010. Proc. 14th International Static Analysis Symposium, SAS 2007, G. Filé & H. Riis-Nielson (eds), Kongens Lyngby, Denmark, 22-24 August 2007, LNCS 4634, pp. 437—451, © Springer, Berlin. Proc. Int. Conf. Computer Safety, Reliability, and Security, SAFECOMP 2007, Francesca Saglietti and Norbert Oster (Eds. ), Nuremberg, Germany, September 18—21, 2007, Volume 4680 of Lecture Notes in Computer Science, pp. 479—490, © Springer, Berlin. O. Bouissou, E. Conquet, P. Cousot, R. Cousot, J. Feret, K. Ghorbal, E. Goubault, D. Lesens, L. Mauborgne, A. Miné, S. Putot, X. Rival, M. Turin. Space software validation using Abstract Interpretation. Proc. 13thData Systems in Aerospace, DASIA 2009, Istanbul, Turkey, 26-29 May 2009, © Eurospace, Paris. Le Journal du CNRS, Nº 182, mars 2005, page 35, Le CNRS, l'A380 et l'aéronautique de demain. Le Monde, Nº 18741, 27 avril 2005, page 18, L'avion qui "bat des ailes" a fédéré de nombreux chercheurs. Software ohne Fehl und Tadel by Karlhorst Klotz, Das M.I.T. Magazin für Innovation Technology, 21 June 2005. Le Journal du CNRS, Nº 185, juin 2005, page 25, A380 : Le CNRS à la fête. Le Journal du CNRS, Nº 185, juin 2005, pages 25-27, Sécurité : toujours plus ! The development of the Astrée Analyzer was supported in part by the French exploratory project ASTRÉE of the Réseau National de recherche et d'innovation en Technologies Logicielles (RNTL, now Agence Nationale de la Recherche, ANR) (2002—2006). The final review of the ASTRÉE project was on July 7th, 2006. (‡) All spam emails to not containing ASTREE (in uppercase) in the subject are automatically filtered out.